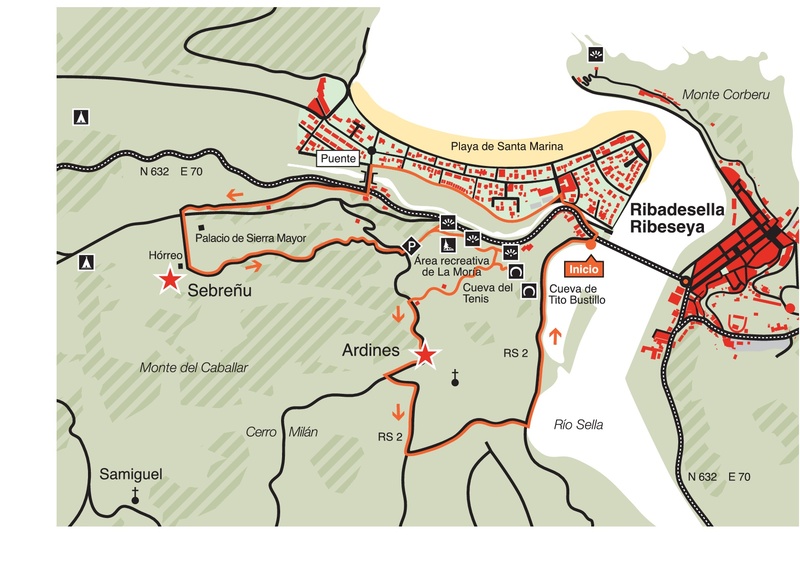 Short description of 7 hiking routes in Ribadesella. Maps of the routes and some pictures of each route. Distance 6.5 kms. Time 2 h. Difficulty, easy. Suitable for mountain bike. Circular route. 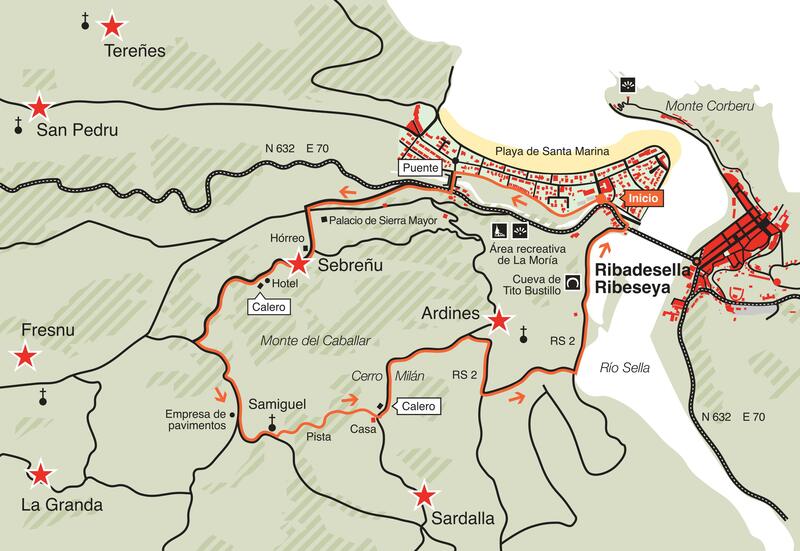 From the town’s seafront, the route follows the Ardines massif and La Moría recreation area, offering incomparable panoramic views of the town of Ribadesella and its surroundings. The massif presents the forms of karst landscape (sinkholes and hums) above an interior landscape of caves, such as those of El Tenis, La Cuevona or Tito Bustillo. Distance 10 kms. Time 3.30 h. Difficulty, difficult. Not suitable for mountain bike. Round trip route. We head east from the village of Santianes and once past the last buil- ding we take the right-hand track at the first crossroads. The route then goes off track and rises relentlessly through the vegetation to a pine wood at the foot of El Mofrechu, the highest peak in the borough. 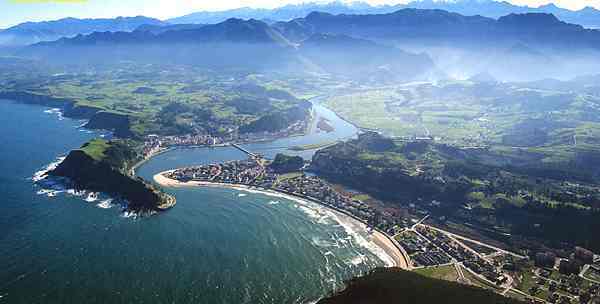 This route is dedicated to the first woman who writes in asturian, Enriqueta G. Rubin. Distance 3.7 kms. Time 2 h. Difficulty, easy. Suitable for mountain bike. Circular route. 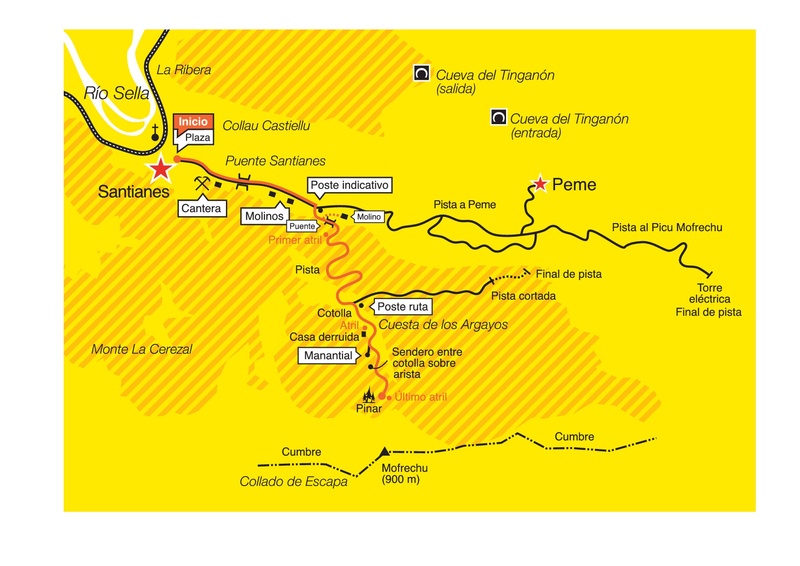 Recommended for children from 4 years.The walk runs from Llames de Pría taking the road to Belmonte, turning off 800 meters along the route of the Pilgrims way to Santiago to the medieval bridge; crossing it its take the signposted course of the march and move in parallel to the river. The path continues passing several times over the river and enjoying the view of old mills and small bridges. Distance 9.5 kms. Time 3 h. Difficulty, moderate. Suitable for mountain bike. Circular route. A route that will allow us to admire traditional mills, some of which have already been restored. The walk runs along a signposted path from Cue- ves that climbs up to the road to Tresmonte. We then take this road. Once past the first house in the village, there is a path off to the left running alongside the bank of the stream which leads to the River Sella and from there back to Cueves. Distance 19 kms. Time 5 h. Difficulty, moderate. Suitable for mountain bike. Circular route. A route through the eastern part of borough. It runs through incomparable scenery that will allow us to enjoy popular architecture, the country-side surroundings themselves and the succession off different cliffs from Guadamía recreation area onwards. 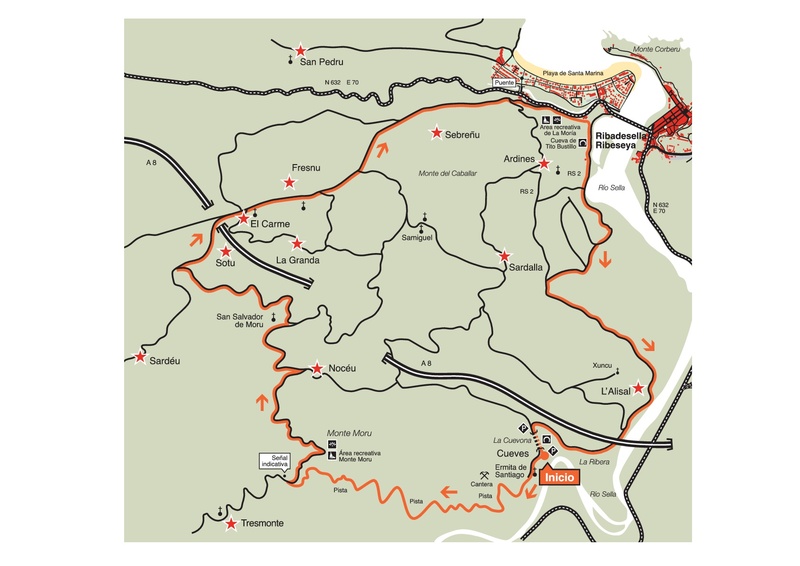 On the second half of the route, we follow part of the Road to Santiago on its way through Ribadesella. Distance 20.5 kms. Time 7 h. Difficulty, difficult. Suitable for mountain bike. Circular route. 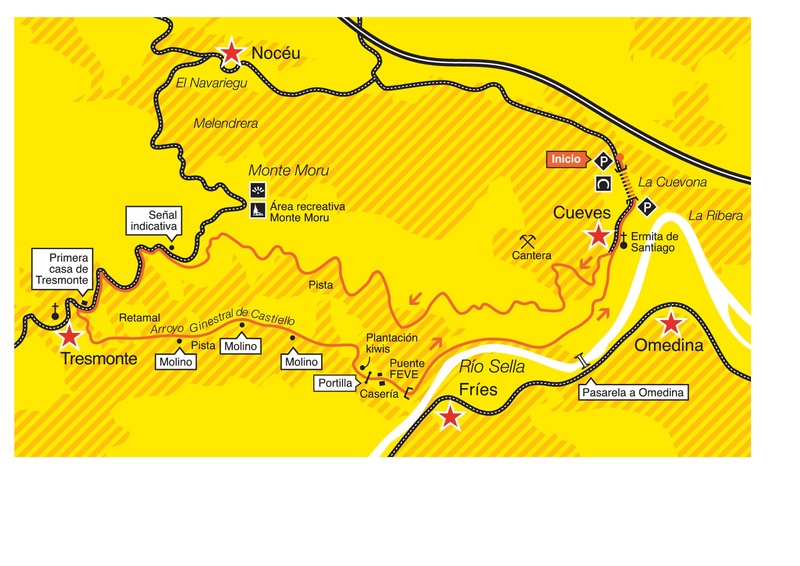 The route starts out from the Cuevona in Cueves, a typical farming village on the banks of the River Sella, to the ascend along a track to the scenic balcony of Mount Moru. 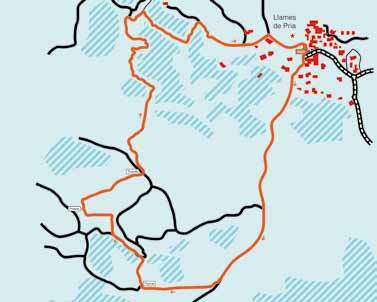 This path back passes through some of the most outstanding villages in the western part of the borough, such as El Carmen, home to the Ribadesella Territory Museum. Distance 7 kms. Time 2.30 h. Difficulty, easy. Suitable for mountain bike. Circular route. A route over the Ardines Massif with the added attraction of seeing three limekilns. These masonry or brick constructions were used to obtain lime by firing limestone rock in the kilns. In Sebreñu: the Sierra Mayor mansion (16th c.). in San Miguel de Ucio: a church built in the popular baroque style (17th c.). Literary Route. Sierra Escapa. RIbadesella. 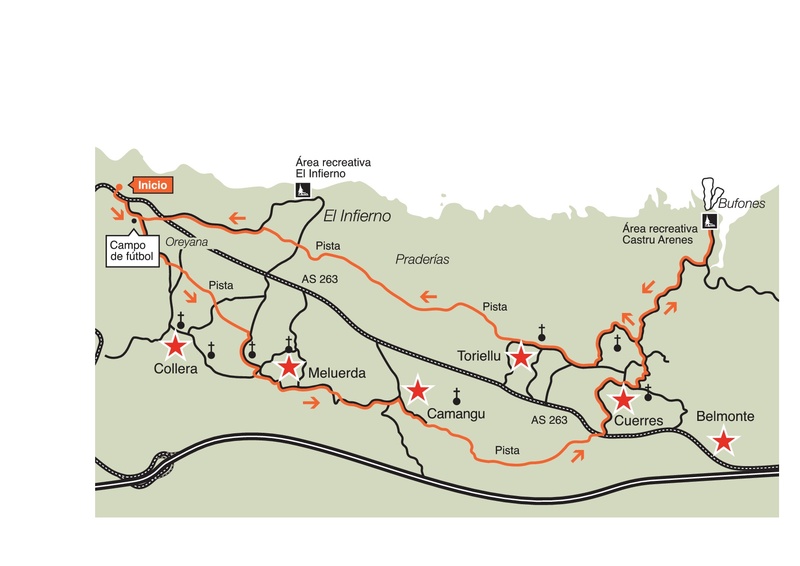 Oreyana Guadamía Route. Castru Arenes Cliffs in RIbadesella.